With Marketing and Distribution in Kya-Sand, Gauteng, consisting of a professional sales team, a fleet of 2, 3 ,4 and 20 ton trucks, and a national network of selected distributors, DinnerMates supplies major contract, corporate and independent caterers, fast food chains, educational institutions, hospitals, the hospitality trade and food factories. 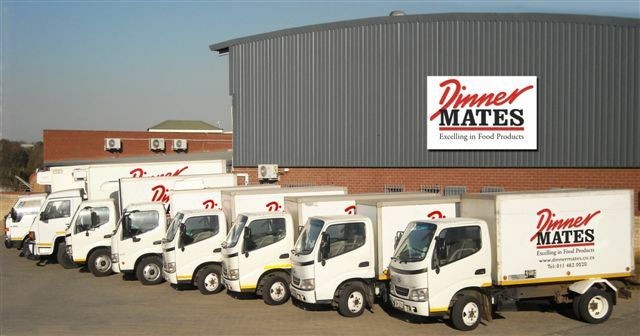 A Minimum of 90% of orders placed today, is delivered the following working day in the greater Gauteng Province by the DinnerMates fleet of refrigerated trucks. DinnerMates distributes country wide via selected Distributors.